As some of you know I am collection the 4WD buggies from my youth.From Boomerang to Terra Scorcher. Well at least I was till this popped up locally on GumTree for a good price. Told myself I was buying no more buggies till I had the ones I have finished. You know that lie we tell ourselves and the boss. 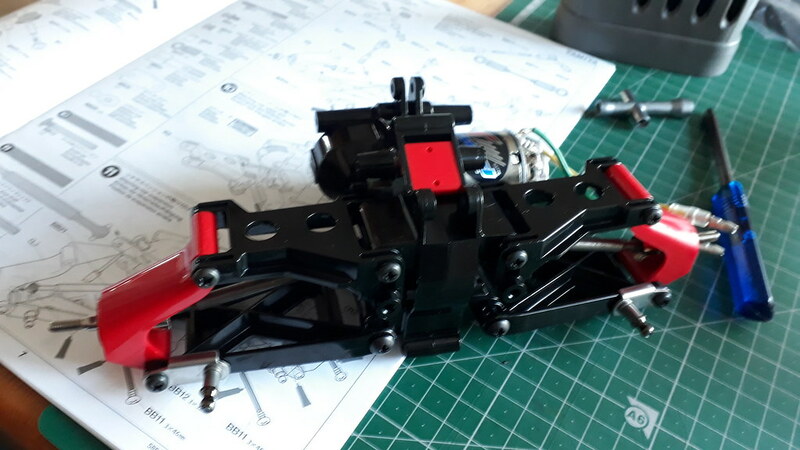 It came with a box instructions and loads of bits and bobs, in full running order as it was raced. Ok so its not got the right wheels, or tires, the body is BRUSH painted inside and OUT!!!!!!! badly round the decals. BUT it was only £60 and came with Hi Caps and 2 Tamtec cars with it. 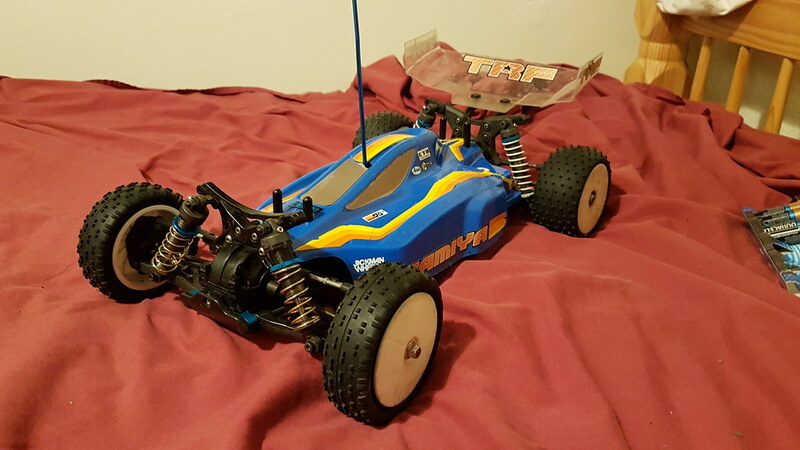 The Tamtecs are already with a new owner, the wheels, original blue shocks and near bald tires and body are on their way and the money from the Tamtech's paid for for the car and the bits so its basically free.....This hobby pays for its self!!!!!! OH the lies we tell ourselves and our other half's. NO MORE until I have finished all the work on the ones I have. I do LOVE the look of the MadCap and the Astute so if they ever came up at the right money.....And a Nissan King CAB, oh and a monster beetle, a lunch box (OK all the monster trucks really) maybe a FROG or a FOX as well BUT only at the right price.......honest!! **** who invented eBay you have a lot to answer for. SO what have you bought cause you found it at the right price rather than went looking specifically for it. I know exactly how you feel. My collection has ballooned to over 45 models, not including a few boats, planes, mini-z's, and heli's. I always tell myself no more, till I spot a deal that I simply cannot pass up. I tired a few years back to sell the collection down to 15-20 cars, but it didn't make me happy, so ended up re-purchasing the same cars I had just sold off. That was truly wasteful spending on my part, should have just kept the original collection alone. I now look at it this way, I do not drink, I do not smoke, and really do not spend money on anything else besides family, and then the hobby. 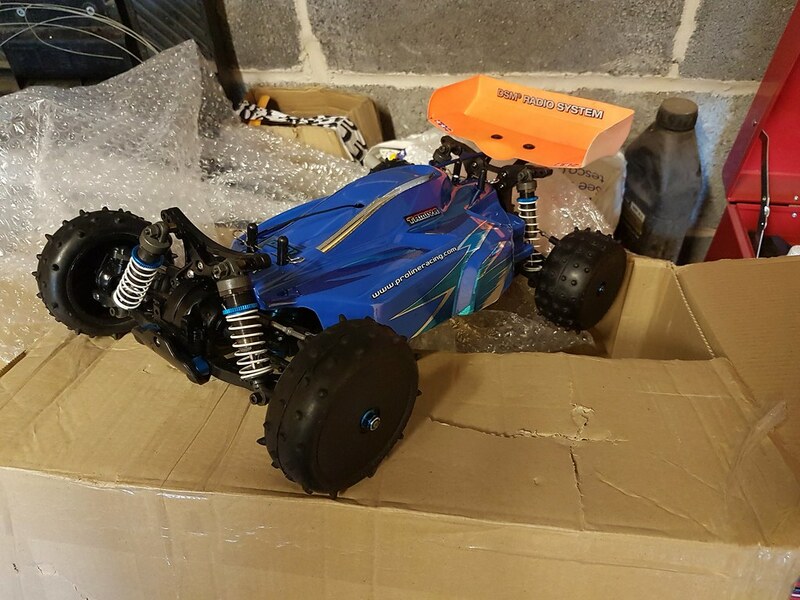 Its good clean fun, the kids like it, the wife will always get over another 4 wheeled toy, and it doesn't hurt anybody in the end. That is a nice find indeed! Looks like all the bits are there, just needs a refresh. @Hobbimasteranother non smoker who dont drink. We are pretty rare. more bits arrived. Just need the blue shocks of original for the complete look. The Black CVA's I have are a much better shock BUT not box art. 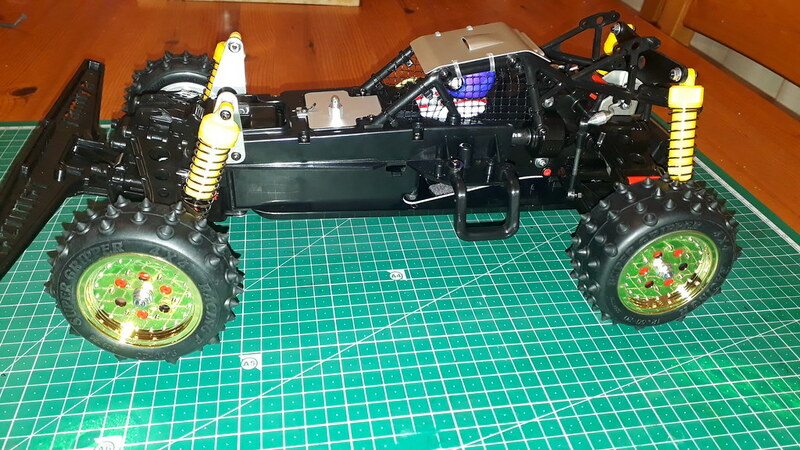 just need the blue shocks and to get some silicon spray on the tires and get the display cabinet to put it in. Well I finished it today. 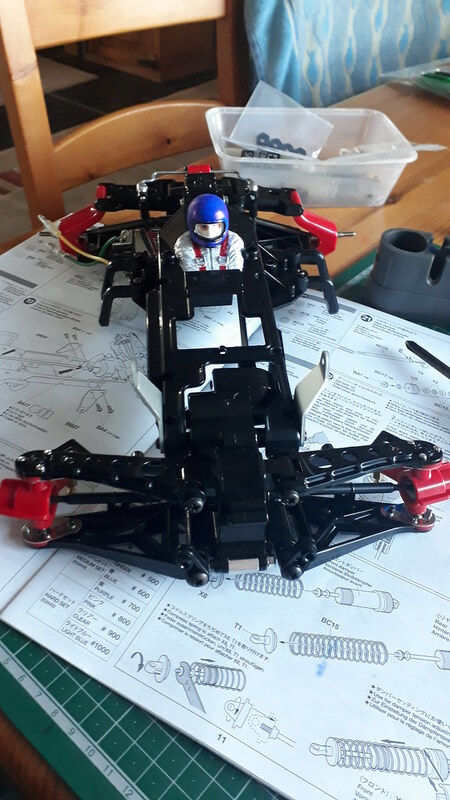 Changed the body, Wing, shocks, wheels and tires. Have to say I am really rather chuffed. Love an astute now !!!!! I have bought another 2 Madcaps, one a never run virgin with all pristine cept for some of the decals. The other was just a really keen price - Will the astute body fir a Madcap? "Buy another Buggy" just rolls of the tongue oh so easy doesn't it? at this rate I will run out of display space!! Got this on eBay as I think its the second sexiest of the vintage 4WD after the Vanquish. The fact I had noticed a set of NIB vanquish rims did not help me resist the urge to bid near double my supposed limit.....just topping £200 with post. Used a white paint pen and colour sharpies for the driver. Pretty happy with it.
. and as far as I can go till I get body done. I will order the vintage MCI decals and do it as a Super Shot. So thats the last slot in the Display case filled !!!! erm now what. OH, I could get 2 more on top!! OR OR move the lunchbox and pumpkin to the top and I can get 4 more in.......phew though I needed another case there for a minute and I don't really have anywhere for it!!!!. Good lady is laughing at me as I try to justify (while being skint!!) buying another for my case. Now I need a HotShot 2 (to complete the full set of 4WD from 1st to Fire Dragon) OH and 2 more shelves for the display case. Of course I also had to order the decals from the Original as well. I'm told that 'good' museums have at least 10-20X the exhibits stored away in their archive collections, to be rotated onto their display areas. You'll also be reducing UV exposure damage by keeping some items in the dark some of the time. Its Ireland -UV exposure behind glass in a darker corner...... while it rains and we have the fire running in front room! Appreciate your idea and concern though and love the logic!! Is your goal merely to fill that display case/s with RCs that don't get run? Surely you need a runner for every mint built? Plus a 3rd to keep MIB. 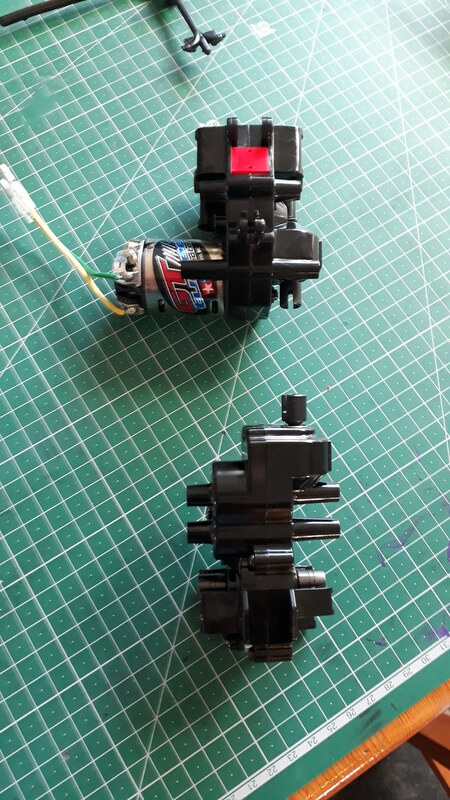 I run Traxxxas these days as I found they break less, especially if there are 3 in close space and 2 drove by kids.......Tamiya's REALLY don't like head on's. I am not aiming to simply fill the display cases. I am attempting to display the Tamiya old school buggies I have. As a lot of you also find its a bit of an addiction and as we are in a position to afford it we do so. HOW MANY of you had the guide book as a kid and it was very well used with pages falling out and knew every single spec from all the ones we were even vaguely interested in? I also did this on Mountain bikes, then Motor Bikes and Then cars and Trikes. 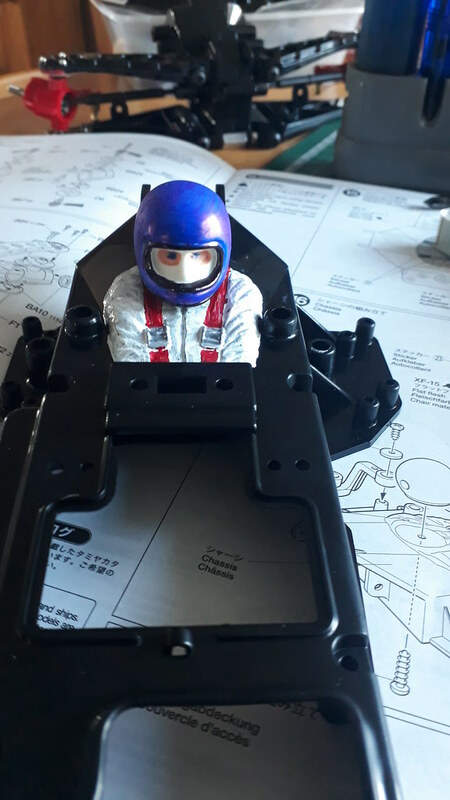 As we are in a position to now have MANY Tamiya cars in a relatively short period of time we do. ITs like letting that child from our youth free and if we still get a kick from it....then why not. As a bonus my kids all love the display and constantly change their mind as to what they deem to be their favourite. Also arrived are the Decals for my Siant Dragon and SuperShot as well as a set for the Hotshot so I can make the shell match the original rather than the re-re. lol..... nice mate ,.... 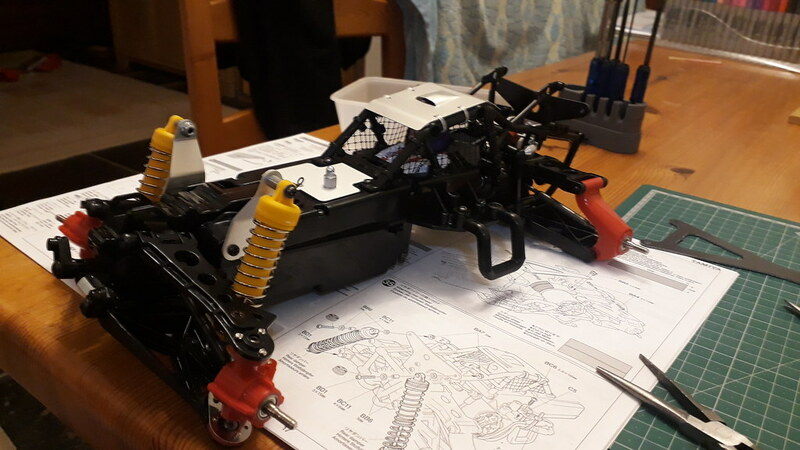 I still love to look at my SuperHotShot think it has the best of all three ...still got to strip to fit the new diff sets I got last year ..
Chuffed it arrived ok, hate posting things. You are slipping though - sold my supra to @Carts and he has finished it already!